Instructions: For the base of the card cut white cardstock 15-1/2 x 9-1/2, score at 7-3/4 from the longest side and fold. The card consists of three layers, for the first layer choose green color pattern paper from the collection and cut it to the size of 7-1/2 x 9-1/4" and distress the edges. Adhere on the card base with clear drying glue. For the second layer cut red color cardstock 7 x 8-3/4" and arrange on top of first layer with 3D foam tape. For the final layer choose pattern paper from the collection cut it to the size of 6-3/4 x 8-1/2" and adhere on top of second layer with clear drying glue. Die cut white cardstock using largest and second largest die from the Eyelet Oval Die set. Color the largest die cut out with Colorbox ink - Concord. Arrange the oval die cut out on the right hand side of the card and frame using the largest die cut out as shown. Stamp white cardstock using the images from Wishing Well Oasis Cling Stamp Set and die cut with coordinating die. Color the images with pencil colors. Arrange colored wishing well images in the center of the die cut oval with 3D Foam tape and desk image on the lower left side of the card as shown. For the flowers stamp white cardstock with Tweet Cherry Blossoms Cling Stamp Set using Archival Ink - Carnation Red. For stamping the leaves use Archival ink Library Green, die cut the images with coordinating dies. Color the flower petals with Archival ink - Carnation Red and Leaves with Archival Ink Fern green and Leaf Green. 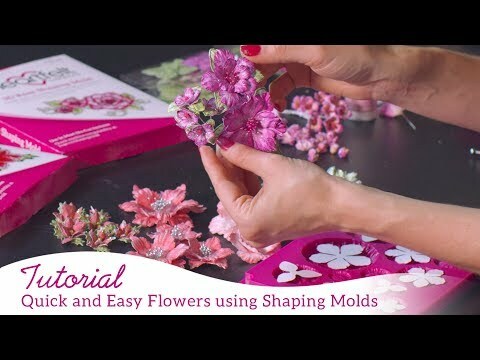 Shape the flowers and leaves using the 3D Cherry Blossom Shaping Mold. For the center of the flowers use Power Outage Prills. Stamp white cardstock with the leaf branches from the Cherry Blossom Retreat Cling Stamp Set using Archival Ink - Library Green. Die cut with coordinating die and color the images with Pencil Colors. Arrange the leaves and flowers as shown. Finish off with a die cut sentiment tag from the paper collection. Apply Crystal Clear glitter on flowers with clear drying glue.